Most of my regular readers know that I work as a canine massage therapist and helping elderly dogs and those recovering from injuries is very rewarding for me. Many of my clients use massage for their dogs as a way of staving off the need for non-steroidal inflammatory drugs (NSAIDs), or at least to keep the dosages of these drugs as low as possible. So here’s a wee story of something that happened to me this week. I was working on a dog who I have been seeing for 18 months. He’s a lovely Labrador and he is starting to have the aches and pains of old age. With a regular 5-weekly regime of massage, he’s been pain free. This happens fairly often. Some people like to test me to see if I actually know what I’m doing (some owners remain doubtful about complementary therapies) but most of the time it is because owners doubt if the changes they observe are real. When you live with someone with a chronic health condition and see them on a daily basis, it is often hard to pick up changes in their condition. In this case, it was the latter. This lady wasn’t confident that she was really seeing her dog running stiffly. He was tight, but was moving freely when he left after his massage. What’s the lesson here? It’s unrealistic to expect a massage therapist to ‘solve’ a dog’s problem in a single visit. Dogs have to get used to the therapist and massage is a new experience for them. So, the first visit is usually a time when they aren’t as relaxed because they are uncertain. Because I keep notes on every massage session, I can refer back to these to track a dog’s condition. This is no different than what your vet does. When I am familiar with a dog and their unique characteristics, I’m much better able to pick up changes and act swiftly to help. In my last blog post, I explained how I was going to start treating Daisy with homeopathic fragaria and calc renalis to support good dental health. So now I’d like to remind everyone how homepathic remedies are made. This diagram outlines the process, but doesn’t fully explain how the remedies are made. (I was sent this diagram a long time ago and I’m not sure of the original source for it). The first step is to create a mother tincture out of the plant source. The plant material is cut up and crushed and left to soak in an alcohol and water solution in a dark place for some time. The period of soaking is long enough to draw the properties of the plant into solution. When the maker of the remedy understands that the mixture is ready, they will strain off any residual plant material. This is the mother tincture. 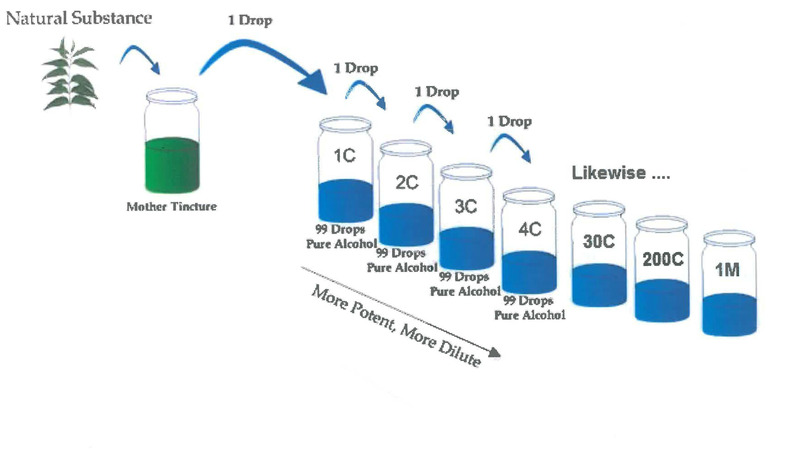 One drop of the mother tincture is put into a vial and then nine drops of a solution of alcohol and water and shaken vigorously. This results in a 1X potency. With one drop of the 1X potency and nine drops of the diluting solution and another good shake and you have 2X potency. For the potency of 1C, this process is done 100 times. (C is the Roman numeral for 100). In most cases, homeopathics start with a 6C potency. Other common potencies are 12C, 30C and 200C. I’m most familiar with the 30C potency which is often the starting point (it’s what I’ll be using). However, when there’s an acute condition that requires a bit more energy, I use 200C. It’s also important to understand how your homeopathic remedy is made. My homeopathic vet prefers that the remedies are made by hand by an experienced homeopathic pharmacist. Major commercial brands like Weleda, on the other hand, use a manufacturing process for potentizing. Homeopathy is a really interesting discipline and just one of the complementary therapies available to help your dog attain and maintain optimal health. On Friday evening, Prime showed a BBC documentary on owners of special needs pets. It was great to see this issue being covered on New Zealand television because there are owners here who need support as they care for special needs pets. I love working with special needs dogs in my massage practice and the owners of these animals are special people, too. 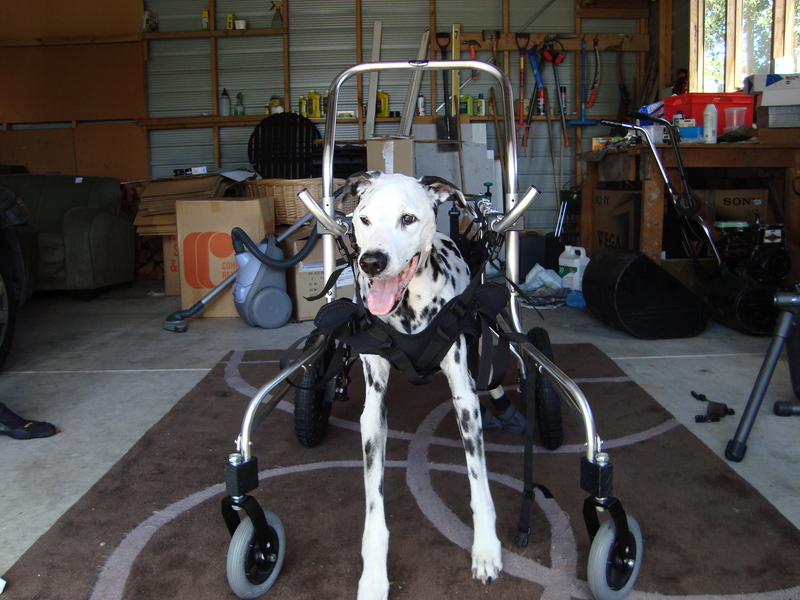 This is Ollie, a Dalmatian who is unable to walk on his own. However, he is not in pain and is very alert and happy. 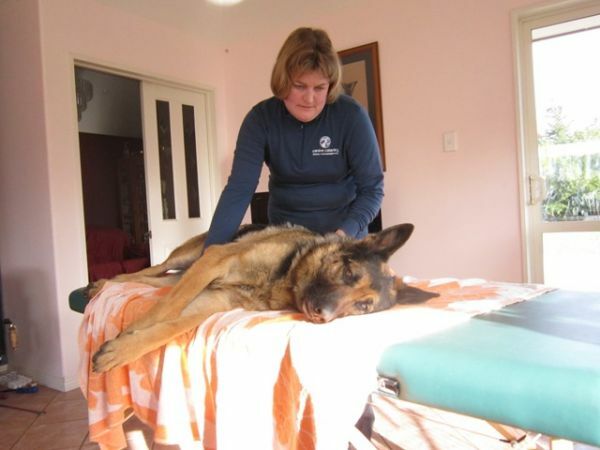 His therapy regime includes massage and acupressure, laser therapy, and regular acupuncture treatments. His strength in his front legs is improving and he has a mobility cart to help him with rehab. Ollie in his mobility cart. Ollie’s mobility cart was purchased from Doggon’ Wheels and imported into New Zealand because his owner could not find a supplier locally. We measured Ollie for his cart and the cart was made especially for these measurements. Daisy went to the vet last week and her vet said she has excellent range of motion in her hips, particularly with extension. Dogs don’t get the same level of extension in their hips through walking or running (Daisy gets walked twice per day). So, I am sure the range of motion is the result of her massage/laser treatments combined with this regular swim exercise. Here’s a video of Daisy at the Dog Swim Spa. You can see that she doesn’t particularly enjoy getting wet. I’m told that many dogs who like the water come to the Spa and jump right in. Not my Daisy! The Dog Swim Spa was designed and built by Chris Blackwood, who is seen in the video with Daisy. The Spa takes referrals from many veterinarians in the Canterbury area, such referrals may include specific instructions on the dog’s condition and rehabilitation.